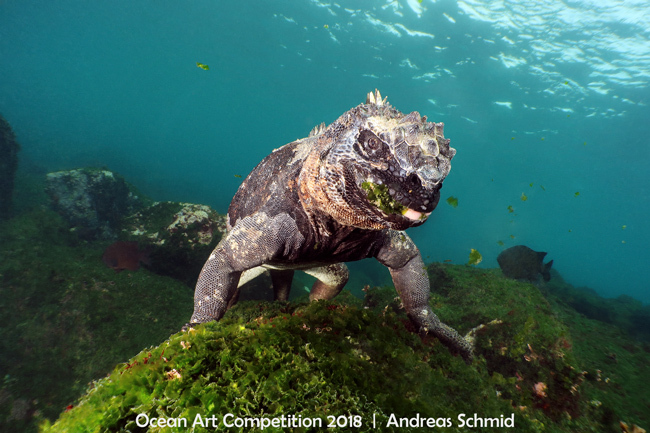 The Story: Marine Iguanas can only be found on the Galápagos Islands and are the only iguana species worldwide that feeds in the ocean. I tried to understand how these very rare and special animals behave and react to the presence of divers in the water by observing them over the course of 3 dives until I figured out how to approach them while they were feeding without disturbing them to get some close focus wide angle shots. The very surgy conditions in the shallow area these animals feed in made it quite challenging to handle the camera and position the strobes but luckily I found this particular iguana which was not bothered at all and allowed me to get off a series of shots.